In fact, the family and the business did not to make the public aware that Harvey had passed away until 10 years after his death. To the traveling public, Harvey personally selected their steaks, sometimes even grew their vegetables. Harvey, born in England, lived in Leavenworth and made Kansas City the hub of his business. After a few false starts with other railroads, Harvey struck a brilliant deal with the Atchison, Topeka, and the Santa Fe railroad to place eating halls in or near their train stations. The first one was in Florence, Kan., in 1878. Soon there was a Fred Harvey restaurant every hundred miles or so along the railroads path to the Southwest. Part of the Harvey deal was that the railroad, with its refrigerated or ice cars, would give free transportation to the Harvey food. Needless to say, this, along with Harvey’s very strict standards of food and service, gave travelers to the West much better meals than before. Soon bad food and dishonest innkeepers were a thing of the past. But Harvey wasn’t satisfied with his male servers. They tended to get drunk and fight. So, in 1883, Harvey placed ads in Midwestern and Eastern newspapers for single young women of good character, between 18-30 years old who were attractive and intelligent. The Harvey Girls were born. Harvey girls were paid a very good wage for the time: $17.50 a month plus free room and board and they got to keep their tips. They also received a free rail pass once a year to visit home. Rules were strict: there was a house mother, a 10 p.m. curfew, no make-up, no gum and no skirt more than 8 inches off the floor. Just as Harvey was very responsible for making the Southwest a tourist attraction, the Harvey Girls were in a way responsible for making the Southwest a family place instead of one peopled by railroaders and cowboys. Out of the 100,000 women who became Harvey Girls, 20,000 of them married customers and became residents of the area they were stationed in. The Fred Harvey empire grew into dining car service and tourist hotels in such places as Santa Fe, N.M., and the South rim of the Grand Canyon. These two, La Fonda in Santa Fe and El Tovar at the Canyon still thrive today, although owned by a different company. Being a chef, one of most amazing parts of this story is the food. I got to look at a collection of menus that are in the possession of The Kansas City Museum and they are sophisticated and extremely varied. Smoked Pork Loin, Steak Diablo, Red Snapper Throats, Turkey and Dressing, Short Ribs, Duckling with Cherries, Lamb Shish Kebabs all appeared. Of course I bought the Fred Harvey cookbook and I’ll share a recipe for a famous dish from Kansas City’s Westport Room in Union Station, named for the floor captain Joe Maciel. You can see a display of various Fred Harvey china from all over the country at Union Station right now, in cases around the main waiting room. 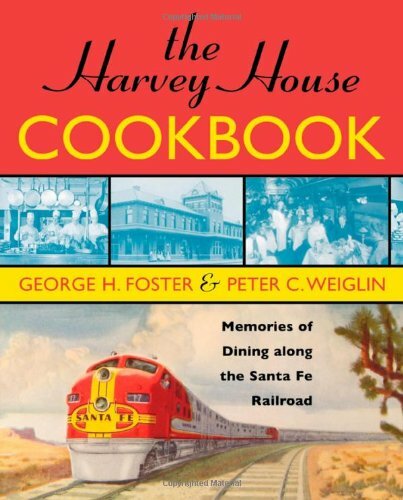 You can buy your own cookbook at the National Fred Harvey Museum in Leavenworth. Check it all out. Harvey was too interesting for a mere five minutes of your time. 1 quart cream sauce made with: 1/2 cup butter, 1/2 cup flour, 4 cups combination chicken broth and half and half. Cut chicken into one-inch squares. Sauté five minutes with curry powder and sherry. Fold chicken and rice into hot cream sauce. Place in three individual casseroles or one large casserole, sprinkle with Swiss cheese and brown under broiler.